The Garden City is dead, long live the City Garden. Against a backdrop of upgrading London’s transport infrastructure, population growth in London of 1.5 million over the next 20 years and an ongoing housing crisis, 2015 saw two key debates: the viability of Crossrail 2 and whether to preserve or exploit London’s Greenbelt. In response, MAX developed a concept that explored the potential of Crossrail 2 in the context of enhancing public amenity and open space in parallel. Crossrail 1 has done a great deal right, but Crossrail 2 can do much more. If Crossrail 1 has been about development, commerce, growth and intensification, so Crossrail 2 should be about the people it is designed to serve. It should be about social sustainability, environmental improvement and communities. 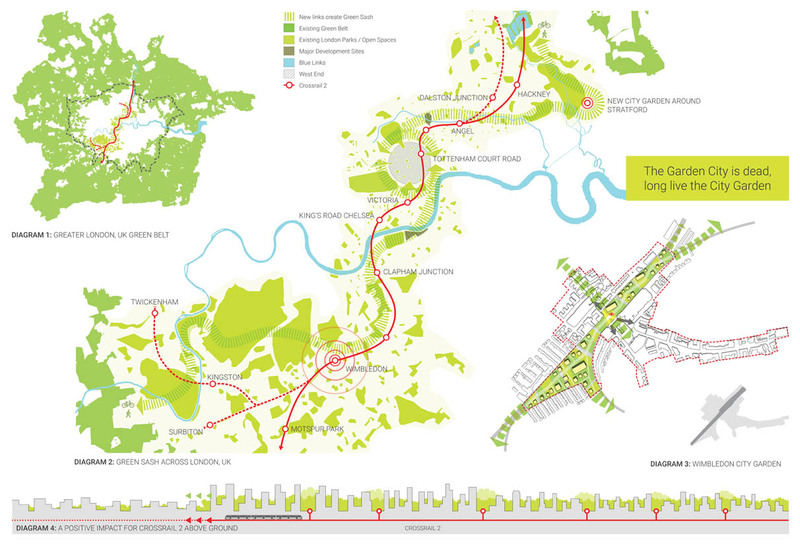 We developed a creative proposal that envisages a Green Sash running SW/NE across London along the path of Crossrail 2, building on an existing network of green spaces, delivering new amenity spaces small and large, linking existing spaces and improving accessibility across this network. In parallel, we envisaged significant intensification along the fringes of this sash, bringing new homes and live-work spaces through innovative building typologies where the amenity is greatest. In the process, the Green Belt would be both preserved and enhanced. The green sash would be anchored by new City Gardens at Wimbledon and Stratford.